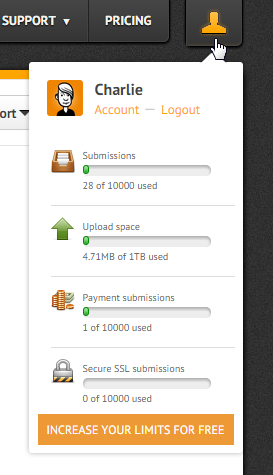 It says I am over my quota yet I've only had 21 submissions...not 100. Upon checking your account, I see that the email you used here in the forum is associated with the account username medcitymom, the account type is in Premium Subscription plan now, please see our pricing page for the details of each account type. I'm guessing that you reached the quota for guest account which is 20 submission/month, because I see that you have just registered an account to us. You can also check your account limits in your settings, make sure you log in to your account.